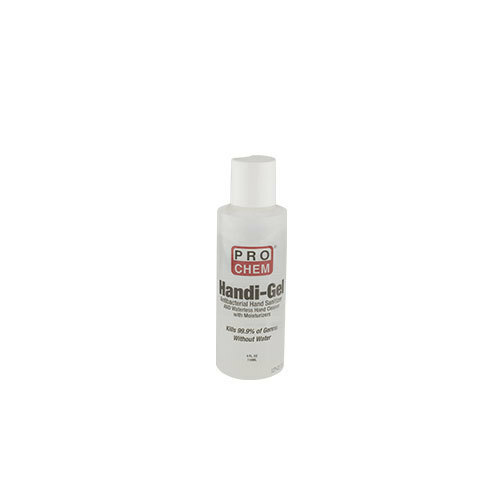 Handi-Gel | Pro Chem, Inc.
HANDI-GEL is an FDA compliant, antibacterial hand sanitizer and waterless hand cleaner that effectively kills 99.9% of germs. This thick formula allows for full coverage, penetrating hard-to-reach areas that harbor bacteria between fingers and around fingernails. It contains the CDC recommended 62% of ethyl alcohol which allows the product to dry in seconds. Frequent use is not a problem, as this formula contains Aloe Vera Leaf Extract and Vitamin A & E. These extra emollients replenish skin moisture that the alcohol removes without leaving a sticky residue. To decrease bacteria on skin, apply enough product in palm to cover hands. Briskly rub hands together until dry. Danger: Flammable. Keep away from fire or flame. For external use only.